How has marathon recovery been going? I’m just over a week past Twin Cities Marathon and I’m pretty impressed with how my recovery has been going. I wasn’t sure what to expect since this was my first marathon. I haven’t needed much time off after my halfs, usually I’ve jumped right back into regular exercise. Even after my 20 mile race, I got out for a run the next day to get my mileage in for the week. So I didn’t have any expectations for when I’d get back to anything (except for hoping I’d be back to working out the week after) and just decided to take it as I went. Right after the marathon (well after we had a late lunch at Mike’s parents) I tried to take a nap while Mike picked up Vinnie from boarding. But I just couldn’t fall asleep. Surprising since I always crashed after my long runs. My legs were just twitching the entire time and keeping me awake. I even tried elevating my legs with pillows to see if that would help. I eventually gave up to have a second round of pizza and take an epsom salt bath. That seemed to help some but I was still pretty sore and my legs were twitching. It was a challenge getting up off the couch and I was exhausted the rest of the night. I think I ended up finally going to bed at nine (taking off my compression socks) and managed to fall asleep then with my legs elevated. 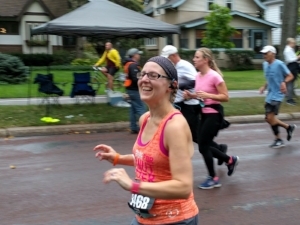 October 2, the first day after Twin Cities Marathon, had me feeling pretty stiff and sore. I basically rolled out of bed that morning and I was glad that I took the day off from work. Getting up and down was still a struggle but Vinnie and I managed a two mile walk in the morning. Then I went to my massage which made my legs feel a ton better, grocery shopped and went home to nap. I kept on feeling better as the day went on and decided I’d pack clothes to at least go on the elliptical at the gym the next day. I could tell that keeping moving was helping my legs recover. Two days after the marathon I went back to work. I was still stiff and it was interesting getting up and down from my chair. Luckily, I didn’t have any stairs to navigate at work because I probably wouldn’t have made it up or down them. I was feeling pretty good and did twenty minutes on the elliptical after work. It wasn’t too bad and it probably helped that it’s low impact. Three days after the marathon and the tightness in my legs were finally gone. I was itching to get out for a run at this point but knew it wouldn’t be the best idea. I decided to do a longer elliptical session (I think I ended up doing forty or so minutes) and if I was feeling good the next morning I’d go for a run after work. And now that I’m in my first week of being back on a schedule and have been doing pretty regular working out? I’m feeling pretty good. I still have some tight spots but nothing that isn’t abnormal for me. So I’m keeping on with foam rolling (which I need to get better at again because I’m going much quicker than I should be when I roll) and taking epsom salt baths. I’m really glad that I felt better as quickly as I did because I would have gotten really antsy if I hadn’t. Now, I’ll have to admit that at a certain point in the race I really don’t remember much of what was happening. I was just in pure survival mode with the rain to make it to the finish line no matter what. But here’s what I remember of the 2017 Twin Cities Marathon. I woke up at 4:15 and started my breakfast of coffee (finally!!!) and oatmeal. Mike had dropped off Vinnie at boarding the night before so we wouldn’t have to worry about him. Which was good because I was worried about the race enough. Mike got up at about 5:30 and we were out the door right about 6. I almost forgot my tank top since I didn’t put it on with the rest of my running clothes since I had pinned my bib on the night before. Good thing I had hung it in the closet right by the outside door and spotted it as we headed out! Mike and I dropped off his car down by the start in St. Paul (not realizing it was $20 cash only, luckily Mike had enough cash and I could stop my car in what was technically a no parking area). It was a little bit of extra hassle but well worth it in the end. Then, we were off to Minneapolis which only took us fifteen minutes. I ended up jumping out of the car at a red light since we weren’t sure where/if Mike could park anywhere close by. I was on the side of U.S. Bank stadium where the marathon starts at about 6:30, which was good because the 10 mile started at 7 and it was already crazy over there. I was right by the first section of port-a-potties so I jumped in one and then stood nearby until about 7, where I jumped back in and then headed towards the corrals. I was looking to see if I could find some water to take a couple sips of (because my throat was pretty dry) but I ended up running into another first timer I knew from the group (and from the Lake Minnetonka half)! We talked until right before we had to corral up (he was in corral 3 too but was going to be running with a faster pacer) which helped pass the time. Especially when it started down pouring at about 7:10 and we had to run for cover to try and stay dry. I got into the corral and tried to move to about the middle, looking for the 4:45 pacer. I didn’t see her but I ran into a couple of other first timers who wanted to be by the 4:45 pacer! We eventually found her and started off to the side of her. At about 8:16 (according to my chip start), we were off! It had stopped raining when we corralled up and I took off my throwaway fleece as soon as I got into the corral. I felt great starting out, going through downtown Minneapolis, and just let the pacer go ahead of me so I could keep her in my sights. My first mile was slow, 11:06, but I was warming up. I eventually sped up too much (but it still felt comfortable) and my first 13 miles were all below 11 minute miles. I’m pretty sure the pacer was doing faster than an even 10:53-ish pace because she was ahead of me for a good while even when I had around 10:20-10:30 minute miles. The first spot I would see Mike, his dad and sister Amy was going to be between miles 6 and 7. I knew that I wanted to get over to the left side of the race (from where I started on right) because when I’d see them around mile 20 and 22 they’d be on the left side (the easiest to get to) and I didn’t want to be moving over that late into the race. It’s a good thing I did because that was the side I was on when I saw them first! I spotted his sister Amy and her bright pink Zag On ‘Em sign (a My Brother, My Brother and Me reference) and then I saw Mike and his dad. They didn’t see me until I started waving my arms as I went by. Amy ran along the course for a little bit and let me know they’d see me at mile 10 (Amy and Mike’s dad were biking along the course, Mike was driving and I thought I’d be seeing him next at mile 20). Mile 10 came and I went by grinning again. I was having such a great time soaking in the crowd, giving kids high fives and enjoying myself. I was also super excited to see Mike there since I wasn’t expecting to see him until mile 20! It started raining sometime between mile 10 and 13, stopping right before 13. I was wiping off my glasses on my tank and apparently someone was cheering for me! I don’t know who it was because I didn’t get my glasses on until I passed by the first timers I was with got my attention so I could wave to whoever it was! Mile 16 and it was raining pretty constantly by then. Not super hard but enough that it was making it tough. But I was still doing strong, my pace was between 11-11:45 minute miles at this point and I was still running. Except for the water stops, I walked briskly walked through all of those. Once again I saw Mike, Amy and their dad and got a little pep talk from Amy as she ran along with me. I was getting close to crossing over to St. Paul and the next place I would see them was at mile 20, right during the slow incline up to Summit Avenue. But I was on a route I had run a lot during my training and I knew what was coming up. It was raining pretty good by the time I got to mile 20 but I was going strong. I saw Amy’s pink sign first and then realized my parents were there too! They had gotten in early enough to make it to mile 20 when I thought I wouldn’t see them until mile 22! Mike’s mom and other sister Katie were there too! 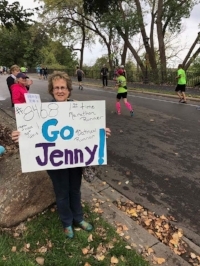 My mom had also made a sign (which I didn’t know what it said until I saw a picture after the race since it blew away at the end) and she had her cowbell. I ran up to Mike (scaring him because he was taking photos and it was like I came up to him out of his camera, gave him a good hug and continued on. Amy continued running with me again, asking how I was. Apparently she found it funny I asked her how she was doing in reply. I told her too about the puppy I had missed out on petting. Seriously, a fluffy golden retriever puppy was on the opposite side of the race with a sign that said “Pet me for power” and I couldn’t get over to it! When Amy was running with me, I did happen to see a pony in someone’s yard which made up for it). From there, it was up the hill at mile 21 (which I’m very proud of running all the way up to the top. I couldn’t believe I was still running at 22, it was the furthest I had ever run and I was still feeling pretty good. The rain was coming down harder now. I spotted Amy and her dad again, this time minus the pink sign. They let me know that there’d been a lot of traffic and my parents and Mike would see me at the finish. Amy ran with me for a little bit and then Katie did too, both of them making sure I was doing good and didn’t need anything. From then on, things got tough. I was getting worn down from the running and rain. I wasn’t cold since I kept on moving but it wasn’t ideal conditions. It was about mile 24 when I started walking a lot more. 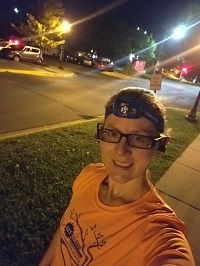 I kept on running for little bursts at the time because I knew I wanted to run in the last 0.20 miles and if I didn’t keep doing little running intervals I wouldn’t be able to get my legs running again. There was a lot more people out on Summit than I expected and I don’t know if I would have made it through as strong without the volunteers and crowd support. People were still out there for the runners even in a pretty good rain! When I ran past one of the aid stations, I got double high fives from the two paramedics in the course that were giving them out to every single runner they could. It really made a huge difference in this rough race. I made it to the top of the hill, right at the Cathedral of St. Paul and looking straight down to the State Capitol. Everything was downhill from here. I’m pretty sure I ran down the hill a little bit but I can’t remember. I was in full on make it to the finish line mode. I could see mile 26 easily ahead of me. There’s always a St. Paul and MInneapolis fire truck, with a huge American flag hanging between them over the course. The flag was soaking wet and wrapped around itself from the wind but I knew I was almost done. I hit mile 26 and I started running. I wasn't going fast but I was running. Then I could see the finish line in sight and hear Carrie Tollefson announcing finishers as they went across (which was amazing and comforting since I hear her voice every week on her podcast). Two guys went sprinting past me to the finish line and I followed along. I was going to give everything I had and cross the finish line! I made it across and paused my Polar as I made my way to the medals. As I got there, I was greeted by Vanessa, the Twin CIties in Motion employee in charge of the first timers group. She congratulated me on finishing my first marathon and wrapped a space towel around me to warm me up and pointed me towards the food and finishers shirt. 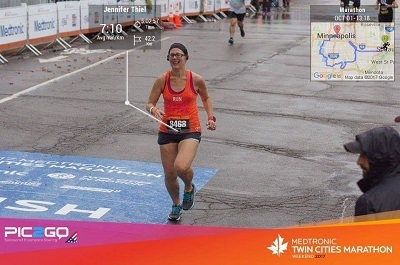 It was so awesome to be greeted like that at a race, an unforgettable moment and why I love Twin Cities in Motion races. One thing I didn’t know is where Mike and my parents were. I was trying to hold onto my food, phone and finishers shirt (why don’t get give you a bag?!) and wandering over to the Caribou stand where we were going to meet. I hadn’t seen them along the course at the finish but that’s because they were at the top of stands (which is where my mom’s sign flew away!). We finally met up and they took the stuff from me and my parents gave me flowers and hugs (Mike gave me lots of hugs too) and we headed back to the car. In the car, I got to read through a huge comment thread in one a running Facebook group I’m in! One of the members started it and was posting updates as I got to the different tracking spots. It was amazing to read through the thread and all the encouragement. I almost started crying again (there was a lot of tears). Plus, I got to see the updates Mike posted on Facebook too! We got back to Mike’s parents house finally and I showered, ate most of the my baked potato pizza and drank my sour watermelon beer. Best end to a race ever! One last day of strength training before the marathon. This week is a week of last _______ before the marathon. Of course, Saturday was already my last cup of coffee until marathon training. Which explained why I felt like I was dragging a little through the day. But it was a really great feeling strength training session. I did my normal warm up on the elliptical and move onto the weights. Although I did do the pyramid setting on the elliptical (going up and then down in resistance) which I haven’t done in a while so it was nice to mix it up. The good news is, no strange pains at all during this session! I’m pretty confident that I’ve made it through marathon training without any injuries which feels awesome. This run, hands down, might be the best feeling run of marathon training. I was a little bit worried about how my run would feel during tapering since I keep hearing about how people have some of their worst runs during this time. But fall weather is back in Minnesota and I just felt like I was flying on this run. I couldn’t believe that I was running sub-10:30 minute miles for this entire run and I didn’t feel like I was pushing it even. Maybe it was the fact that this was my last run in that pair of Brooks Ghosts before the marathon. Yup, one last run in race day shoes. It feels so strange to say that. It was also my last three mile run of training too . Of course, cutting down on the mileage means I’m getting pretty ansty during the day. I feel like I have all this extra energy that’s not going anywhere. It’s funny that I’m feeling this way because I normally get a little down and low energy when tapering starts. No I’ve just all antsy and energetic/tired at the same time. It’s going to be a wild ride. While Tuesday’s run felt awesome, I felt like I was dragging on my Wednesday run. It’s probably a combination of things. I’m still trying to get over this cold. It was a 5 a.m. run. And, it was Give Day at my work which meant I’ve been a little bit crazy at work. When I’m not training for a race, I do fundraising for a seminary so I’m a key player in our Give Day. So, back to the run that I was getting in so I could go to work at my regular time (versus going in a little bit later like I’ve been doing on Wednesday and using up vacation time). I was just worn out this run and felt like I really had to push myself to keep going. It probably didn’t help that I had thought I only had three miles this morning and it threw me off when my watch told me I had to do four. And you don’t argue with the watch (after double checking it against another copy of your training plan). One upside was that it was still cool and not humid outside! So, the weather is still on my side for not being hot. And I ran into another runner who I’ve seen often on my morning runs and it turns out he is training for Twin Cities Marathon too! Since I’m training on my own, I sometimes forget that other people I come across on my runs could be training for the same race. In terms of lasts, this was my last 5 a.m. run before the marathon! I have a two mile run on Saturday but I’m going to be sleeping in as much as I can that morning. The plan is just to wake up naturally and get out at some point in the morning. I might actually miss these early morning runs. It’s nice to get out and get something done before the sun is up. Rest day today which meant yoga. It felt so strange to have a rest day on a Thursday. But first, I had to go into work. Luckily, I only worked until noon since I put in extra time on Wednesday so it went by super fast. Then I came home, took Vinnie on a walk and did a yoga video while he napped in the sunshine. It was really hard to concentrate during yoga and I ended up stopping the video early (although I still got in 30 minutes since I choose a longer video). I think it’s just a continuation of the jitteriness I’m getting from tapering this time. Plus, the jitters from running my first marathon soon. Another rest day! Plus I slept until Mike’s alarm went off at 5 a.m. since I wasn’t going into work which felt really nice. And I slept all the way through the night for the third time in a row which is a good streak for me. The last month or so, I’ve been waking up in the middle of the night to go to the bathroom so it’s nice to have uninterrupted sleep. I headed to a yoga class at the gym, since it fit in nicely with heading downtown on the light rail to the expo. It was a much tougher class than I was expecting at 8:30 a.m., I was dripping sweat by the end! But since it was tough, I was also more focused on the class than I have been doing videos during marathon training. Luckily, I had planned on showering after the class anyways so I didn’t go the expo sweaty. I did a writeup on my first day the expo so you can read about what I did and bought. I had a super speedy two miles as my race shakeout run. Probably not the best thing to do but it was nice and cool outside and it felt awesome to run fast. Plus, I was getting race day jitters so I was getting some of that energy out. That works, right? Of course, I felt it in my calves right away so did some deep foam rolling to get into them. I tried to keep the rest of the day less active since I was going to run 26.2 miles the next morning(!). I knitted a little, napped a little and then went back to the expo for the first timer’s panel and group photo. It wasn’t a whole lot of new information since I’ve done a lot of races in general by now and have been doing a ton of reading on marathons but it was nice to re-hear things. I’ll have a full race recap up later in the week but I am officially a marathoner!!!! !